6.5x55mm Swedish has become a highly regarded hunting round in North America and Scandinavia since its introduction in 1894. This caliber has been used for hunting every size game from whitetail deer to moose, and with great success. 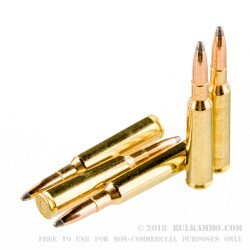 This 131 grain soft point ammo for your 6.5x55mm rifle is a cheap but excellent choice for your next hunt. This round will have good penetration and weight retention while depositing its kinetic energy very quickly into your game, creating a devastating wound channel. A well placed shot should drop even the largest game within seconds. This ammo can reach muzzle velocities of 2,600 feet per second and will have no problem dropping your target at 200 yards and greater. 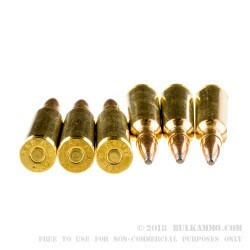 Each round is brass cased, Boxer primed, non-corrosive, and reloadable. 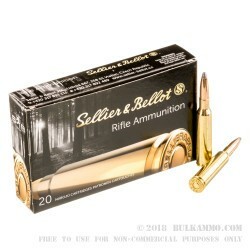 Sellier & Bellot has been producing ammunition since the early 1800's, and they manufacture large quantities of ammo for both government and civilian use. 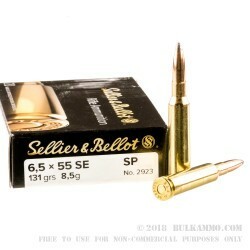 Sellier & Bellot, which is based in the Czech Republic, falls under the same company as another great ammunition manufacturer, Magtech, which is based in Brazil.